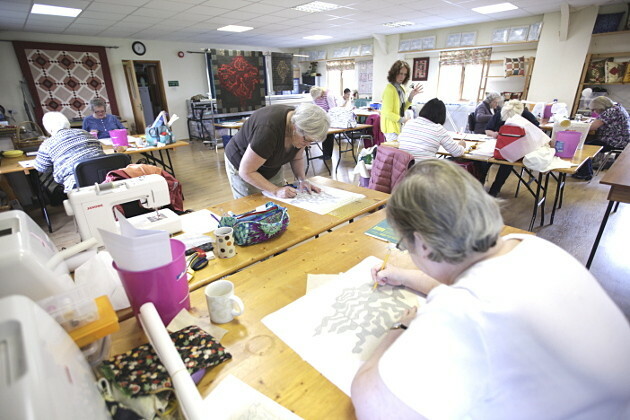 I had a lovely day today with Shropshire Quilters at Castle Court Quilter in Whittington, for a Notan workshop. We were up early and Daf drove me to the pretty village of Whittington, near Oswestry. Castle Court Quilter, shop and workshop, is directly across the street from Whittington Castle. 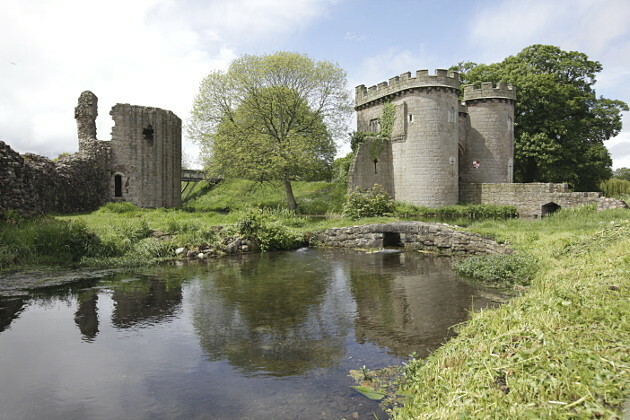 The attractive castle ruins are in the heart of the village on a site which has been inhabited for two thousand years. The workroom was a really pleasant space with good light and sturdy tables. Daf had brought stands with him to hang my large ‘Notan’ piece. Although we would be working on a fairly small scale during the workshop, it’s good to show that Notan can be made any size. Notan is a Japanese system of paper cutting, but can be applied to other media. It’s a great starting point for textile work. I showed some examples to the group, then started them on the first step of the process. On a black square of paper they drew their initial design. They then cut along all the lines they had drawn. On an A2 piece of white paper they aligned the core or the design, then, flipping some of the pieces, they completed their layout and we took time to look at everyone’s black and white Notan designs. I can tell when there’s real concentration in a workshop by the silence in the room. The Shropshire Quilters were very quiet. 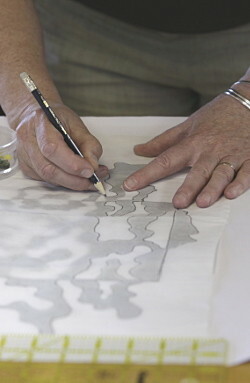 The next task was to transfer the paper design to fabric. 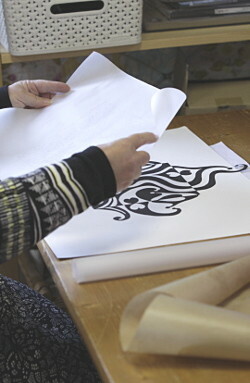 Everyone traced her Notan design onto bondaweb adhesive then ironed that to the back of one of her chosen fabrics. After more cutting out, each fabric was correctly placed on the front of a second piece of fabric and carefully ironed in place. Bondaweb adhesive is heat activated, it melts under the iron. The trick is not to get it on the iron or ironing-board! The final designs were all very different, because of both the layout and the choice of fabrics. I then explained the next stages of this Notan workshop would be completed at home. The piece would be layered with wadding and backing, then quilted and embellished as each quilter chose. We had a lovely day at Castle Court Quilter, with the Shropshire Quilters, and they all thanked me for the Notan workshop, which was lovely. They also gave me a card which they had all signed and put little messages in. What a thoughtful thing to do. Thank you all. This entry was posted in Blog and tagged Notan, patchwork and quilt workshops on 5 June, 2016 by admin.